The perfect companion for every occasion. The vines that produce Prosecco are found exclusively in north-east Italy, in Veneto and Friuli-Venezia Giulia, between the Dolomites and the Adriatic Sea. The particular interaction between the climate, the soil and the winemaking tradition gives rise to Prosecco DOC, a unique wine. We therefore offer you a practical mini-guide on how to always recognise a Prosecco DOC, starting with the bottle. Prosecco DOC bottles are easily distinguishable from products that do not comply with the production regulations, as the State marking for DOC wines is obligatorily placed on each bottle on the closure systems for the container, so as to prevent its reuse and the content’s extraction without inactivating the bottle. This obligation was established by the Ministerial Decree of 30 June 2011.
e) the nominal volume of the product in the container expressed in litres. Each bottle of Prosecco DOC is marked with a unique alphanumeric code located on the side of the collar. Make sure there is the Data Matrix on the bottle collar. It is a two-dimensional barcode that will allow you to verify the authenticity of the bottle if you take a photo with your smartphone! 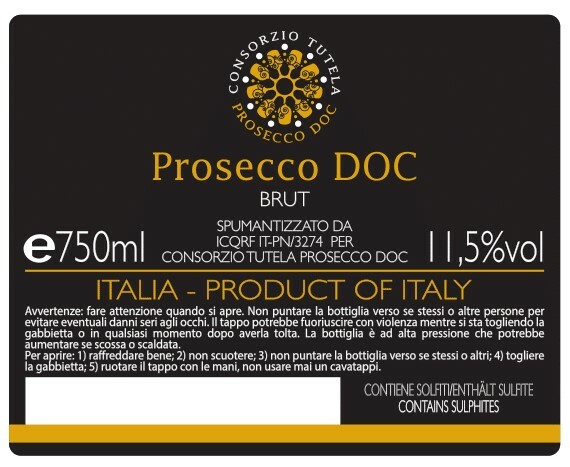 On the back of the bottle the label must obligatorily include the words Prosecco DOC and the certification of origin in Italy - Product of Italy. If you are served it on tap, it is not Prosecco DOC! Prosecco DOC can be produced and marketed exclusively in a glass bottle! So be wary of fake Prosecco on tap and in cans: they are not Prosecco DOC! Prosecco DOC is always white. Prosecco DOC is an exclusively white wine, produced in still, sparkling and spumante forms! In short, if it's pink, it's not Prosecco DOC! As a final guarantee it is possible in some cases to find on the neck of the bottle the Consortium logo to attest the authenticity of the area of origin of the Prosecco DOC. In case of doubts or reports on the wine, write to us!